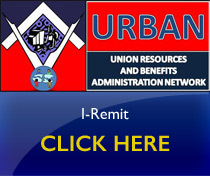 Employers can pay benefits electronically using the URBAN system. The easy-to-use website makes remittance processing simple by allowing employers to save multiple reports, store an employee roster, submit new hire information, upload payroll files, and print purchase vouchers. If you have never used URBAN before, you must obtain a temporary password. To obtain the password, please call the Employer Assistance department at 212-366-7386.